~post by Shappy. To read Part 1 of Shappy’s look at the new books celebrating Topps trading cards, head on over here. Since 2008, Abrams ComicArts has been “treating” us to a series of books celebrating the art of the non-sports trading cards and so far, every volume packs a powerful punch of nostalgia! Mars Attacks! might be considered the grand-daddy of the “gross-out” cards. They came out in 1962 and caused such a parental outrage they actually ceased production of these cards,making the original cards quite valuable. The cards (based on the stories of Wally Wood in EC Comics’ Weird Science) tell the story of Martians with big, pulsating brains underneath glass domes invading planet Earth, blasting earthlings away with disintegration rays and destroying major buildings and monuments along the way. What’s really fun about these cards is that the story unfolds card by card, which meant if you wanted the story from beginning to end you had to collect a whole set. With this book celebrating the 50th anniversary of Mars Attacks, you can now read the lurid tale that inspired Tim Burton to make his cinematic tribute to this classic cult sci-fi card collection! The book gives a lot of behind-the-scenes stories and like the other books in this series comes with four bonus cards and that cool waxy dust jacket! Bazooka Joe & His Gang is a fascinating look at 60 years of Bazooka Bubble Gum and the creation and history of it’s gum chewing mascot Bazooka Joe. 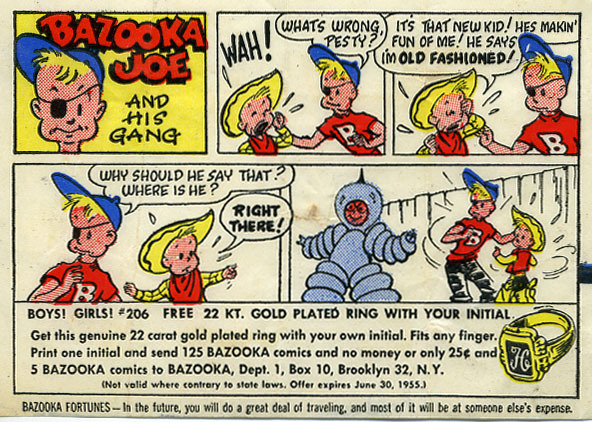 Bazooka Joe and his gang starred in a small piece of wax paper in a 3 panel gag cartoon. In theory you could save these little comics and send them in for premiums like whistles and pocket knives but I never knew anyone who collected on that promise. Even in this book there are precious few photos of the premiums themselves, which makes me think there is some kind of Bazooka conspiracy going on! Bazooka tried all kinds of different cartoons to get kids to buy their gum. Marvel Comics fans will be surprised to find the Fantastic Four and Thor cracking jokes on small pieces of wax paper in here. There are lots of other fun images of old Bazooka ads and displays included. Here’s a fun fact- the artist who created Bazooka Joe (once the the most wholesome ad icons of all time) got his start doing racy comic pamphlets called TIJUANA BIBLES! In fact, artist Wesley Morse drew so many Bazooka Joe cartoons that hundreds of originals still ran after his passing! This might be the best designed book of the series. Again we have the waxy dust jacket and bonus cards, but the outer pages of this book are pink, making the whole book look and feel like a giant piece of Bazooka bubble gum! I swear when I first saw this book I could SMELL the gum! Star Trek: The Original Topps Trading Card Series is the latest release is the one I’m most excited about because it combines all the things that make me geek out- trading cards, bubble gum and STAR TREK! 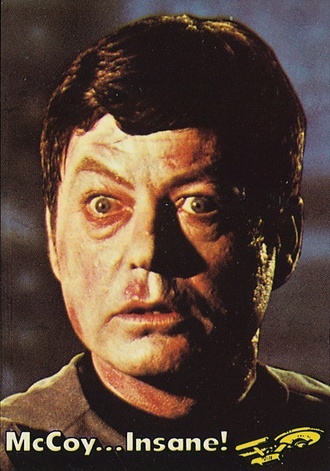 As most Trekkies know, the original Star Trek TV series only ran for 3 seasons beore it was unceremoniously cancelled. But, thanks to the show’s syndication, it found legions of new fans as kids and adults gathered around their TV sets to watch Kirk, Spock and McCoy boldly go where no man had gone before. Sensing there was money to be made, Topps released an 88 card set based on the crew of the Enterprise. However, test-market sales were not as “stellar” as they had hoped and just as young Trekkie nerds (like myself) were trying to complete a set, the cards started disappearing off convenience store shelves. Now finally I have a complete set (with all the stickers!) in this book that also has expert commentary from Paula M. Block and Terry J. Erdmann, who did the excellent Star Trek 365 books. There were plans for a second set that never happened and as a result Lt. Sulu never got his own card! That has finally been corrected with the additon of bonus cards included in this book, which makes it a logical gift for any Trekker on your list! Oh my! That WRAPS up my look at the fine books Abrams ComicArts has been releasing about some of my favorite nerdy artifacts, Topps trading cards! Come to BookPeople and maybe we can trade some cards in the cafe! All of the books mentioned in this post are available on our shelves and via bookpeople.com. Give us a call to check availability (512-472-5050). We ship worldwide! Wacky Packages had a couple of good books about them, too. Also, I always thought the Mars Attacks! cards were based on the movie, but I guess it was the other way around.